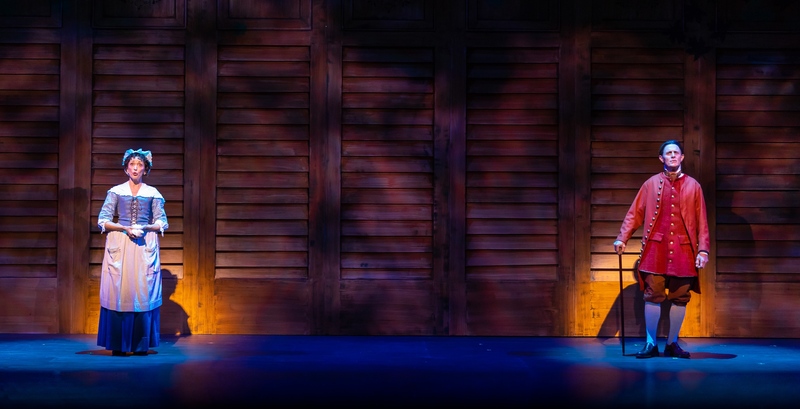 A thoroughly delightful “Semi-History” lesson through song, “1776” is most assuredly a brave and uncommon musical—but nonetheless entrancing (maybe for this very reason.) Not only does it put very human faces (along with some very human foibles) on to all those ‘august’ and ‘esteemed’ figures who fill the pages of our text books, they’re down-right entertaining ones at that! Talk about the ‘art of the deal’! Long before there was any talk of ‘Making America Great’—again or otherwise, America (specifically the United States thereof,) needed to be ‘made’—period! 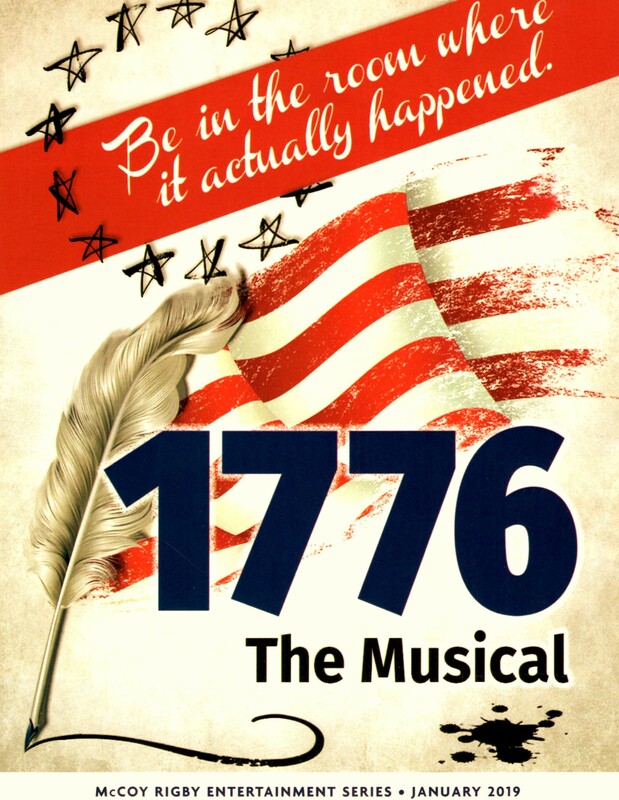 Now, as the latest production of their 2018-2019 season, “The La Mirada Theatre For The Performing Arts” and McCoy-Rigby Entertainment are ringing in the new year with a Tony-Award winning musical that looks at the events of an old year—one that for the U.S.A. truly started it all: “1776”! Featuring music and lyrics by Sherman Edwards and a book by Peter Stone, the history-based plot is inspired by (if not always strictly staying true to) the tumultuous incidents leading up to the writing and signing of the “Declaration of Independence”. More precisely, it dramatizes the efforts of Patriot and future President “John Adams” to persuade his colleagues, led by Continental Congress President “John Hancock”, to vote for American independence and to sign that world-changing charter. Directed and staged by Glenn Casale with Musical Direction by Jeff Rizzo, La Mirada’s current offering features a supremely talented cast, and begins with a deadlocked Congress (–where have we heard this before?!) 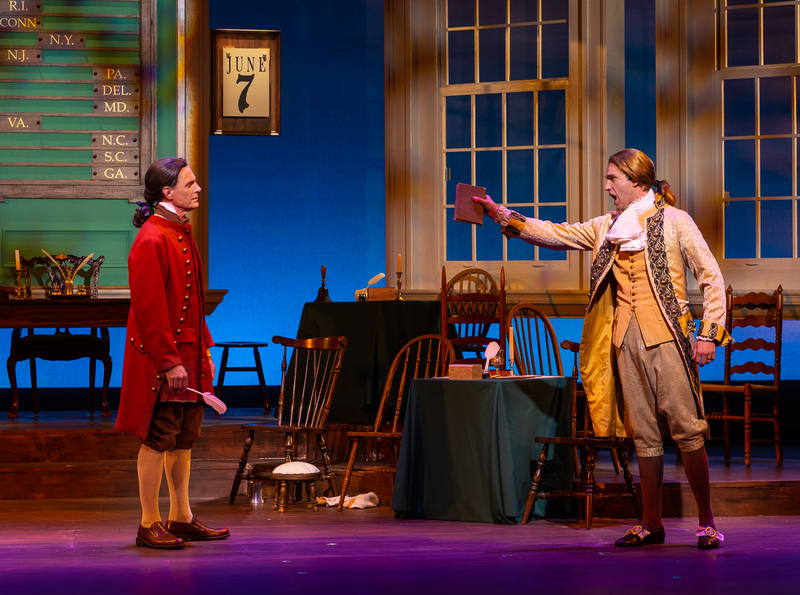 Fatefully though, these contentious Founding Fathers harness their shared determination to do the right thing for a fledgling nation, adding up to a prodigious dose of glorious theater—let alone a musical! Way more than a load of ‘Piddle, Twiddle and Resolve”, it seems the ‘McCoy-Rigby’s of Old “La Mirada” (California) have produced a show you’ll ‘resolve’ to love! Stone’s book (based on a concept by Composer Edwards,) is bold and witty as the delegates continually praise, confront and snipe at one-another freely, while several of Edwards’ fanciful lyrics are drawn directly from authentic letters Adams wrote to wife Abigail. Moreover, their ‘mostly accurate’ libretto daringly tries things never previously attempted with a musical. For instance, in Act One Scene Three—an episode dedicated to debate taken (we’re told) directly from accounts of the meeting, the dialogue runs over thirty minutes without a song-break. As unusual as this may be though, the scene is rivetingly written and even more compellingly acted. Indeed, this ‘free-thinking’ way the script has been fashioned puts the impetus on the acting just as much as the singing, (and thrillingly in both categories, the cast here unfailingly prevail!) Casale’s direction judiciously navigates these exceptional challenges intrinsic to this musical—and masterfully triumphs over them. Consider too, that most of the action occurs on only one set—the inner-chamber of “Independence Hall”, with whatever other ‘locations’ being performed out on the apron of the stage, backed by a wood-slat and Ivy-bedecked scrim that’s lowered to suggest everything from the outer corridors of Independence Hall, to a Philadelphia street outside of Thomas Jefferson’s rooms, or even the deepest recesses of John Adams’ imagination (where he holds mental ‘conversations’–and at least two fantastic duets–with his beloved wife, Abigail.) It’s a unique set-up but Casale makes it all work majestically! Right off, we learn that the Congress is divided (already) into two primary and often opposing factions: The New England Colonies to the North and the Southern Colonies. The action opens as Massachusetts delegate John Adams–our guide through all of what is to follow, stands before those gathered within Independence Hall with numerous complaints over their collective inefficiency as a potential governing body, and from all we can tell, he’s having a bad day: “I have come to the conclusion that one useless man is called a disgrace, two are called a Law Firm and that three or more become a Congress!” he informs us at the outset. This leads into the rousing scene-setting, “For God’s Sake, Sit Down John” as those gathered urge him (for once) to give his constant complaints a rest. It’s a superb group effort and sublime opening that effectively acquaints us with most of the key characters. There’s relatively little formal dance, save for a simple but jaunty gambol between “Benjamin Franklin”, “John Adams” and “Martha Jefferson” upon their initial meeting as a part of “He Plays The Violin”. This is followed soon after by a nifty little group interlude as part of “Cool Considerate Men”, involving the various representatives engaging in a stately, (albeit a tad restrained,) ‘Minuet’—the ‘polite’ ‘touch and bow” way folks “cut a rug” during that age (it’s also another superb example of the ensemble’s combined harmonizing and how moving they can be when combined!) Though these dance portions are relatively brief, they do significantly lift the mood after whatever (routinely terse) is happening on stage—this latter endeavor crucially so, occurring right before the weightier “Act Break”, “Mama Look Sharp”. Performed by one of General Washington’s young, but deeply battle-fatigued ‘Envoys’ come straight from the frontlines, it’s a staggeringly powerful way to bring us into intermission. Act Two opens with “Thomas Jefferson” waiting outside the main chamber overhearing his ‘magnum opus” being read before committee. “Franklin” and “Adams” soon join him where they all begin to literally ‘sing the praises’ of his famous pronouncement and the anticipated ‘birth of liberty’ they hope it will bring about, via their nimble but resolute chanson, “The Egg” as they each argue for their choice of “National Bird”—Jefferson vies for the Dove, Franklin the Turkey, and Adams for the Eagle. Rounding out their trio of recognizable Signatories is Caleb Shaw as the one and only “Thomas Jefferson”. Presenting “Jefferson” as a young idealist with wholesome boy-next-door good looks and a disarming brand of charisma, his take is sort of like the Colonial answer to a Matinee Idol. Although he doesn’t really appear until half-way through the first act, his contributions certainly are worth the wait as he too has an awesome voice which is put into the service of several larger–but outstanding and consequential–numbers like “The Egg” and “Is Anybody Out There”. 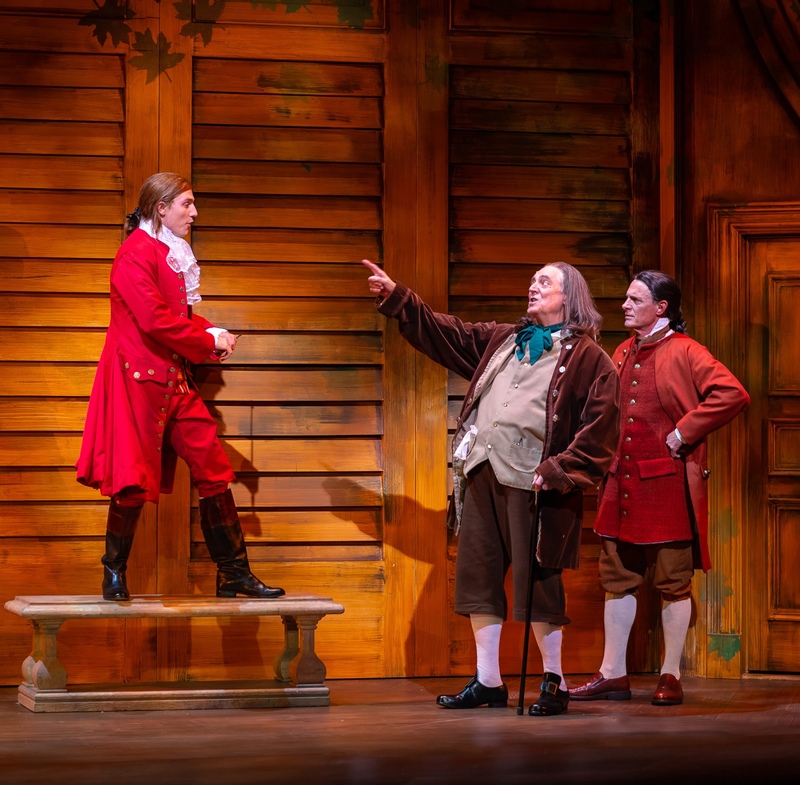 His preliminary ‘outing’ though is titled “But Mr. Adams” in which he, together with “John Adams”, “Ben Franklin” and Michael Dotson as “Roger Sherman” (of Connecticut) and Victor E. Chan as “Robert Livingston” (of New York,) form a new sub-committee charged with preparing the text for what will soon become known as the “Declaration of Independence”. Loaded with witty word-play and ‘mock’ waggish turns-of-phrase, count this one also as a bona-fide Act One Highlight. 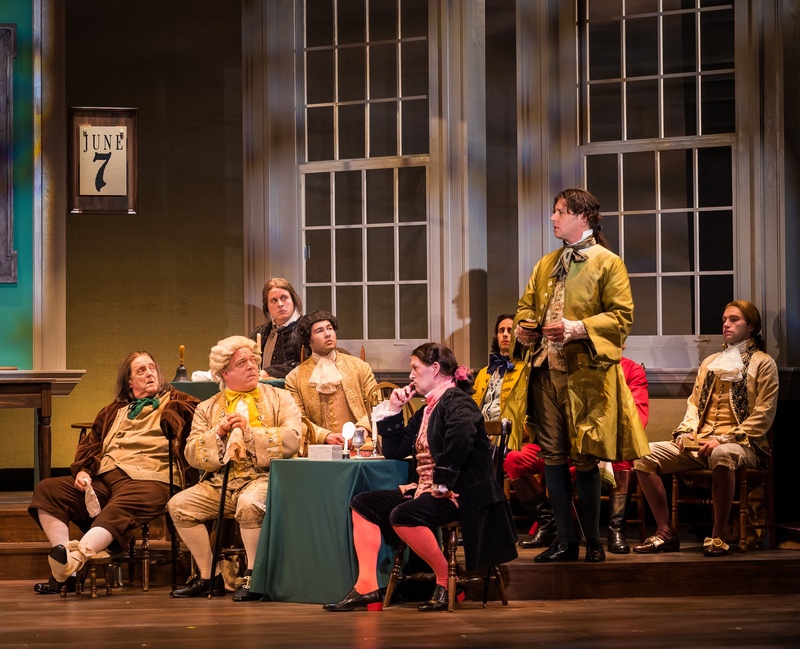 Meanwhile, James Barbour himself captivates in the categorically “un-PC” role of South Carolina Delegate, “Edward Rutledge”—the show’s predominant antagonist. It is Rutledge who most strongly objects to Jefferson’s sanctions opposing slavery in his iconic document’s germinal draft, calling for their immediate deletion in a thunderous number titled “Molasses To Rum”. Exemplifying a mini-history lesson (one of many the show contains,) it essentially outlines what was popularly called the “Triangle Slave Trade” of merchant ships that engaged in the ongoing rotation of cash crops like sugar (or molasses), tobacco, and cocoa, then ‘trading’ them for African slaves, then in turn, trading them for manufactured goods like linens and lumber. This operated on a revolving basis between Africa, the Caribbean and finally such European-governed Colonies like those in the Americas. Bathed in shocking blood-red light, Barbour gives full vent to his incredible operatic tremolo as “Rutledge” bitingly calls out the overall hypocrisy of the assemblages’ condemnation of this practice when so many—including Jefferson himself—have (in one way or another) either actively engaged, endorsed, or outright benefitted from it. Admittedly these sentiments are not at all ‘comfortable’ to hear, but regardless of one’s feelings over what “side it takes” or what it expresses, the number ranks as an undeniably compelling undertaking for any musical, and a true credit to Barbour’s abilities to invest such raw emotion into his vocal delivery. Laudable performances are comparably handed over from others, whose duration in front of the footlights similarly might not be lengthy, but are each incredible while they’re there. These include Nick Santa Maria as the President of the Second Continental Congress, “John Hancock”—the man remembered for being the first to actually sign the legendary declaration, with his equally legendary signature! Presiding over 90% of the action (–and most definitely all the ‘group’ scenes,) Santa Maria stands out very nicely in what could elseways be another thankless role. 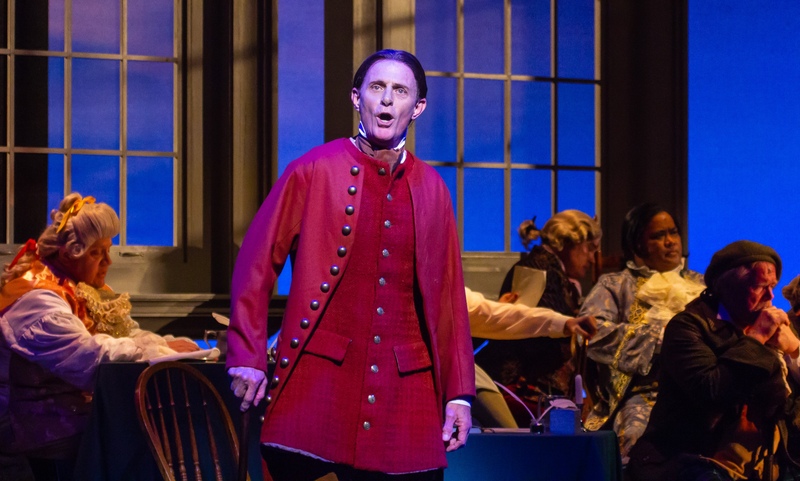 Michael Starr is also a knockout as boisterous-but-likeable, “Richard Henry Lee”. His major contribution comes amidst his buoyant charmer, “The Lees Of Virginia” which introduces us to this frequently ‘glossed over’ Statesman who is convinced to originally propose the need for a formal document (or “Declaration”) putting into words the Colonies’ intent to assert their independence from “Mother Britain” and “King George III”. Through it, he also reminds everyone within earshot that he is the appointee from the oldest and most respected of all the British colonies–and his is among that locale’s oldest and most respected families: “Here a Lee, There a Lee, Everywhere a Lee!” he proudly croons, causing “Dr. Franklin” to interject “They’re warm-blooded people there in Virginia!” Well conveyed and even better received (—and interpolating a built-in encore to boot,) rank this one an irrefutable roof-raiser early on! Not to be overlooked or marginalized either is Nick McKenna as the battlefield “Courier”. Re-appearing all through the story bringing messages from his more and more desperate “Commander and Chief”, his time on stage may be portioned out in small allotments, but he does an absolutely spellbinding job with the climactic “Mama Look Sharp”. Himself in possession of a fine, clarion voice, McKenna smoothly invests each poignant verse (which tell of the loss of two friends and fellow foot-soldiers in one day,) with a haunting simplicity, thus insuring their potent message will resound through the theater and with all those listening! Unforgettable also is Matthew Kimbrough who is nothing short of a hoot as the blustery Representative from Delaware, Scotsman “Colonel Thomas McKean”. Yet, one can’t help but wish though, that the shows’ Creators could have come up with some logical ways to integrate more female characters. As it is, there are only two roles for women, and even then, their involvement tends to be fleeting. While it is a sincere pity they didn’t give these two characters much more to do, gladly both of the ladies cast here brighten up the narrative and delight the audience with their every appearance! Ellie Wyman provides a breath of fresh air and a breathtaking voice as the girlish “Martha Jefferson”—wife to the Declaration’s renowned Author. 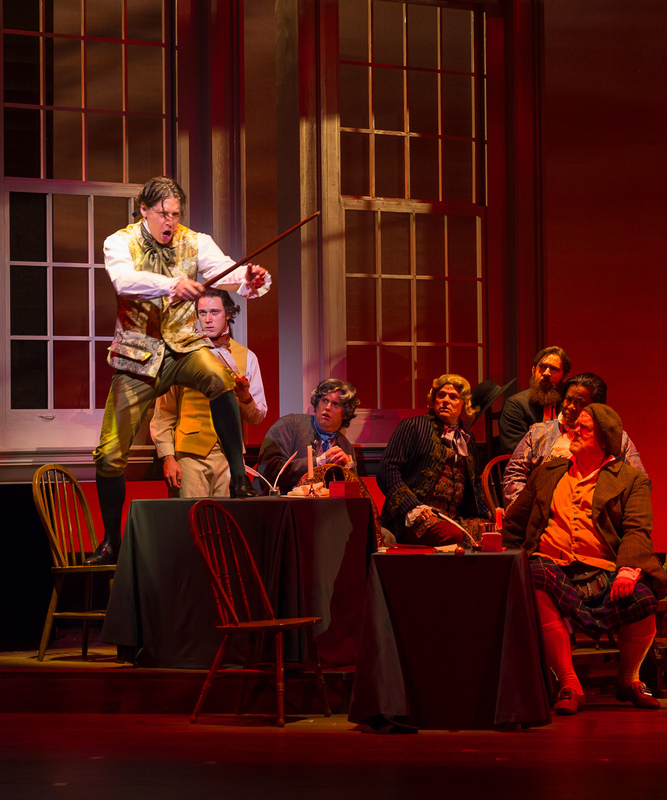 Wyman does a magnificent job at the center of “He Plays The Violin”—one of the score’s more prominent numbers, which also encompasses one of the show’s few dance sections—and here too, she handily excels, making it an unabashed crowd-pleaser. 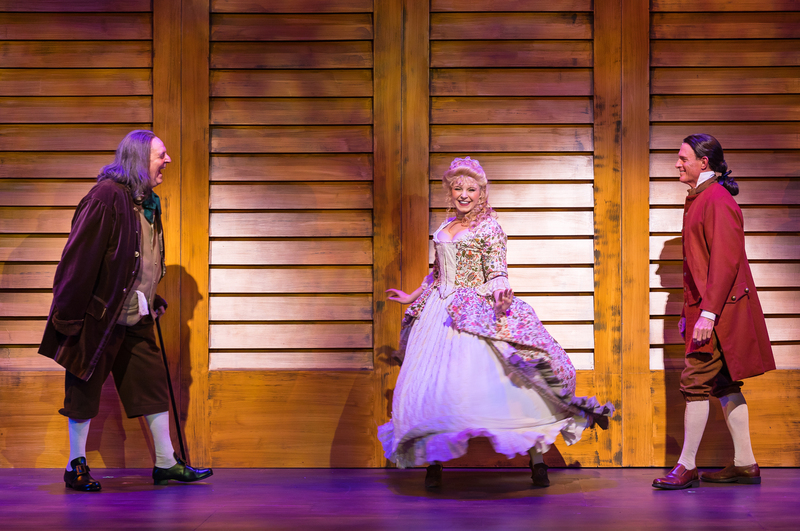 Likewise, Teri Bibb also proves to be a wonder in her own right as John’s ever patient wife, “Abigail Adams”. Hers is another tricky role as she only appears now and again throughout the proceedings—but purely as a figment of husband John’s lonely thoughts. This doesn’t in any way mean however, that Ms. Bibb fails to make her substantial mark; quite the contrary! Gifted with a sweet, melodious tone that belies a genuinely high-octane vocal range, she makes the most of her two duets opposite Mr. Umberger— the foremost being the pensive “Till Then”, the latter with the lilting “Yours, Yours, Yours” (as Husband and Wife, though parted, “recite” their letters of love and longing to one another, trying to keep connected in the face of the distance and duties each are burdened with.) Both performers voices also complement each other’s strikingly making these more ‘illusory’ intervals among the most satisfying of the entire production. In the end, Bibb renders a joyful resolution with her solo “Compliments” wherein “Mrs. Adams” at last comes through on her written promise to supply John, the Congress–and by extension, all the enlisted ‘Minutemen’, with the much-needed salt-peter to make gun-powder with. Every whit as worthy of the center-stage spot-light are Shon LeBlanc’s incredible era-defining Costume Designs–each one dazzling in and of themselves! Especially memorable are “Martha Jefferson’s” pastel gown worn for “He Plays The Violin”, which comes complete with panniers (or side hoops,) not to mention “Richard Henry Lee’s” ‘brazen’ scarlet waste-coat with frilled cravat, and of course, “Ben Franklin’s” slightly oversized frock-coat and knee-breaches (which just about all the gentlemen sport.) All of these are wonderfully complimented by EB Bohnk’s correspondingly expert work on the hair and wigs (this was after all, a HUMONGOUS time for wigs—being worn by both women and men of a certain social status and fashion-ability!) 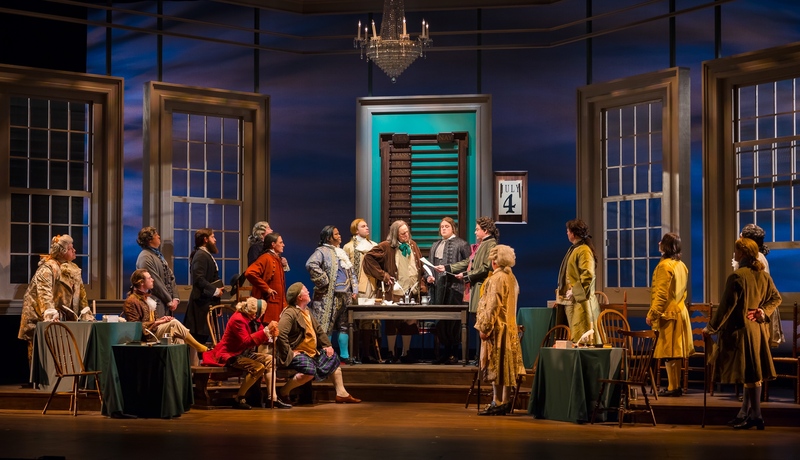 Furthermore, Stephen Gifford’s Scenic Design incorporates that fore-mentioned wooden “curtain” that runs the full-length of the stage and functions as the exterior backdrop for all other locations beyond the interior chamber of Independence Hall. Just before the Curtain Calls the scrim descends, and upon it is fittingly projected the lower portion of the “Declaration” containing all the familiar and factual signatures of the real-life counterparts to those we’ve just seen portrayed. Worthy of note too is Phillip G. Allen and Leon Rothenberg’s Sound Design which takes full advantage of the “La Mirada Theatre’s” newly renovated sound-system making everything from the most unceremonious bang of a gavel to the insistent repeating knell of the Liberty Bell (as the delegates at last step up to sign the momentous document,) positively resonate all around the spacious auditorium! 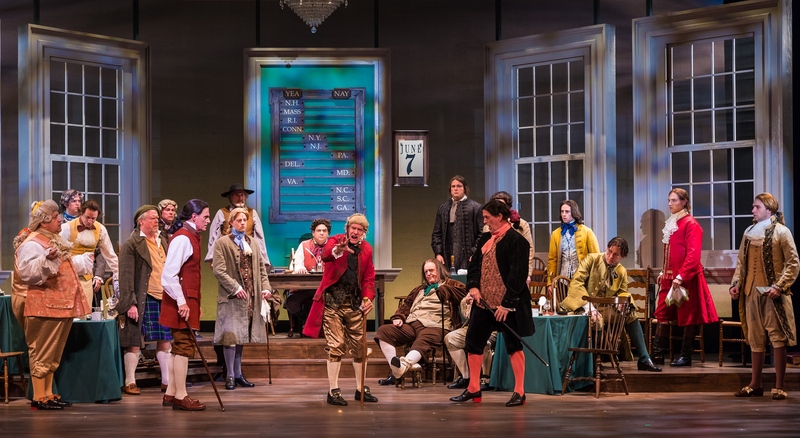 Here’s one issue everyone can cast a resounding “YES” vote for: “1776” is a phenomenal feat of musical-making that’s a “Must-See” for Students, History Buffs or anyone else who savors a bit more food-for-thought from their theatrical experiences! 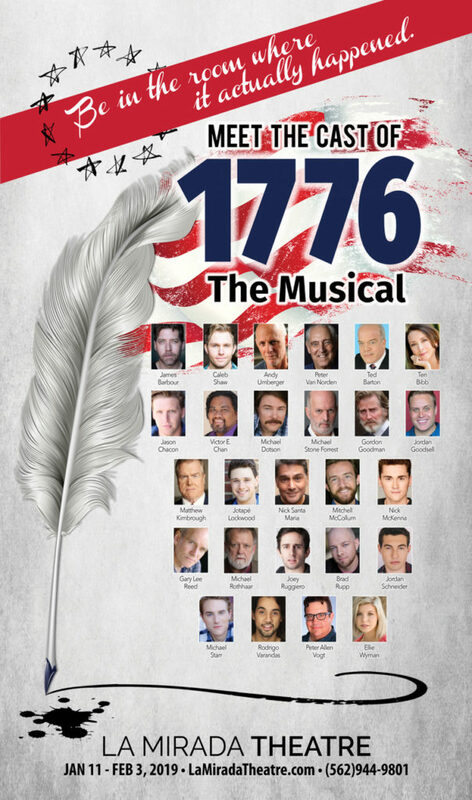 Having opened on Friday, January 11th, “1776” will play through Sunday February 3rd, 2019 at “The La Mirada Theatre For The Performing Arts” located at 14900 La Mirada Blvd in La Mirada California. Showtimes are Wednesday and Thursday evenings at 7:30 PM; Friday evenings at 8:00 PM; Saturdays at 2:00 PM and 8:00 PM, with Sunday Matinees at 2:00 PM. A special audience “Talk-Back” sessions with the cast will be held on January 30th after the final curtain, while an Open-Captioned performance is set for Saturday, January 26th at 2:00 PM, with an ASL Interpreted performance on Saturday, February 2nd (also at 2:00 PM.) Tickets and reservations may be obtained either on-line by visiting the “La Mirada Theatre’s” website, at: https://www.lamiradatheatre.com or via phone by calling (562) 944-9801 or (714) 994-6310. (Student, Senior, and Group discounts are available, with $15 “Student Rush” tickets also available for the first 15 performances of the La Mirada engagement.) Subsequent to this, the show moves to “The Younes And Soraya Nazarian Center For The Performing Arts” on the campus of California State Northridge (CSUN) located at 18111 Nordhoff Street, Northridge, CA for an additional four performances: Friday, February 8th at 8:00 PM, Saturday, February 9th at 3:00 PM and 8:00 PM and Sunday, February 10th at 3:00 PM. Tickets for these CSUN dates can be obtained on-line by visiting https://www.thesoraya.org or by calling (818) 677-3000. Production Stills By Jason Niedle, Courtesy Of Demand PR (www.demandpr.com) And McCoy-Rigby Entertainment; Special Thanks To David Elzer At Demand PR, Tom McCoy, Cathy Rigby, Glenn Casale, Jeff Rizzo & To The Cast & Crew Of “The La Mirada Theatre For The Performing Arts” & McCoy-Rigby Entertainment’s 2019 Production Of “1776: The Musical” For Making This Story Possible. This entry was posted in Theater reviews and tagged "1776 The Musical", "1776", "But Mr. Adams", "Cool Cool Considerate Men", "For God's Sake Sit Down John", "He Plays The Violin", "Is Anybody There", "Mama Look Sharp", "Molasses And Rum", "Piddle Twiddle And Resolve", "The Egg", "The La Mirada Theatre For The Perfroming Arts", "The Lees Of Old Virginia", "Till Then", "yours Yours Yours', 1969 Best Musical Winner, 1969 Tony Award Winner, 1997 Broadway Revivals, 2019 Southern California Theater Season, 2nd Continental Congress, Abigail Adams, American History, Benjamin Franklin, Best Musical Winners, Colonel Thomas McKean, Edward Rutledge, George Washington, Glenn Casale, Historic Musicals, Independence Hall, Jeff Rizzo, John Adams, John Hancock, La Mirada Ca., La Mirada Theatre, Martha Jefferson, McCoy-Rigby Entertainment, Musical dramas, Patriotic Musicals, Peter Stone, Philadelphia PA, Richard Henry Lee, Rigby-McCoy Entertainment, Second Continental Congress, Sherman Edward, So Cal Theater, Thomas Jefferson, Tony Award Winning Musicals. Bookmark the permalink.